My consumer life cycle has gone something like this: always liked nice things. Started out small, but grew out of my budget very quickly. Would work and save for months so I could drop big-time on key pieces twice a year, picking up closet staples that have (1) stood up to wear-and-tear and changing trends very well, and (2) turned out to be ‘statement’ items that people began to associate with me. I believe that process is called personal style, the kind they reference in Vanity Fair profiles. Since joining the real world, I can’t dedicate obscene portions of my disposable income for a single pair of shoes, or a beautiful bag. I’ve had to grow more practical. In experimenting with the alternative of buying cheaper and more often, I realized that, over the long run, it’s those things you save up for, think very hard about, and purchase with confidence, that bring lasting enjoyment. 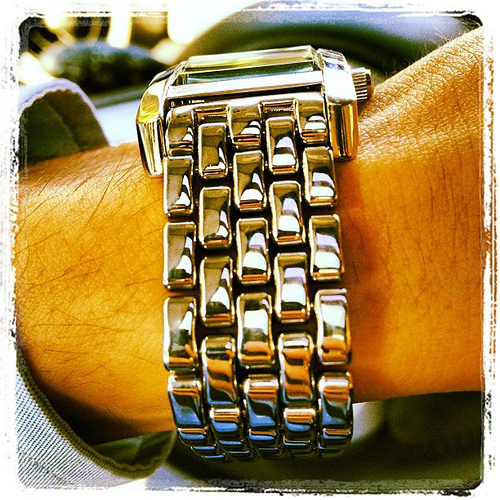 Recently, I’ve desired a new watch, one to replace my five year-old Emporio Armani standby. There are, quite literally, thousands of options and slight variations of the same models, from Fossil and Nixon at the low end, to something I’d save for years for, like a Cartier Tank Solo, Tag Heuer Carrera, or Hermès Cape Cod. 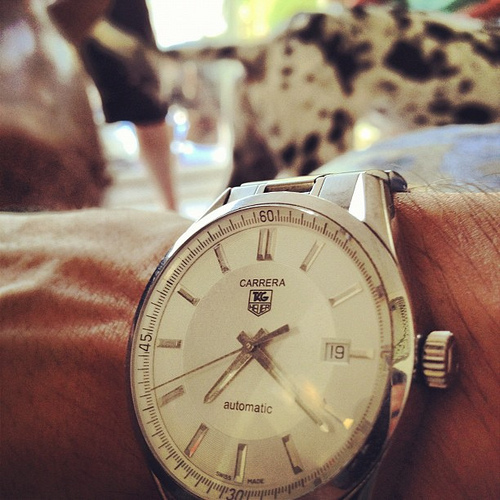 I prefer simple, minimal, non-chronograph designs, on leather or metal bands. That brings down the options quite a bit, as busy and chunky are more popular at the moment. 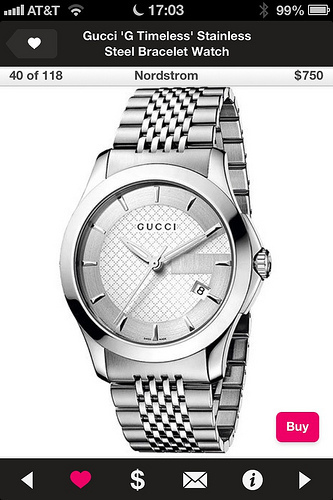 So far, my top choice for an upgrade is the Gucci G Timeless steel bracelet watch. Saw it in Details once and have always liked it. But, at $750, it isn’t something I can pop out on a whim to purchase. Enter the luxury goods budgeter. If I give myself a modest $200/month for non-essential purchases (based on history), then I would have enough to buy the watch after a quick threeish months of saving (though not denying myself the necessities). If I’d begun saving in January, I would be set today. My old self would have just put it on credit, but that’s what got me into trouble, and I refuse to be slave to a retail addiction. Furthermore, having to research, save, and wait can do wonders by preventing impulsive buys that are ultimately regrettable (and add up). Nothing worse than buying something you get bored with after a period, leaving it behind every time you get dressed, and cringing to think how much you spent on it. And ultimately, giving it away. A good way to self-measure is to purge every so often, to see what all you *do* have to wear, but that you *don’t* love or wear, and shouldn’t have purchased to begin with. I’m trying to minimize extraneous, inefficient use of my limited funds – hence the calculated adjustment of shopping habits. We can’t all dedicate our lives to perfecting a style, and most of us don’t have the income for it. But, we can pick up those key items along the way, and take lasting care of them. Although they are more expensive up front, they carry a lower cost-per-wear than the comparable impulse buy. It’s all about perspective, careful planning, and patience. May I humbly suggest a vintage watch? 2) Much better residual value so you can trade up later by trading this one in! Enjoying your site! Keep it up! Hey, thanks Richard! Good suggestion…I will look into it! Ended up moving into a new place and getting a new car, so the watch purchase is on hold for now.